If you were planning to play The Witcher 2 on a FAT32 hard drive, I hope you've got another drive to install it to. Now that The Witcher 2: Assassins of Kings is out (and earning near-universal praise), there are likely going to be a lot of people playing it this weekend. However, before you install the game on your PC, be sure you have an NTFS hard drive to install the game to. The PC system requirements tell players that they need 16 GB of disc space, but it doesn't list a specific drive format. A Joystiq reader contacted the site after he found his hard drive didn't work with the game: "My only hard drive with any storage space left on it is FAT32, and has resisted attempts to reformat. I discovered this hidden system requirement after buying The Witcher 2, downloading it, and attempting to install it this morning." Joystiq contacted CD Project about the issue, and the company's community manager Andrzej Kwiatkowski confirmed the requirement. 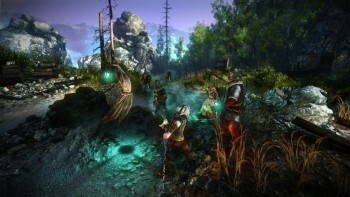 "Yes, we can confirm that The Witcher 2 on Windows systems only works on NTFS-formatted drives," Kwiatkowski explained. "FAT32 can't handle any file bigger than 4GB, and one of TW2's files has the size of 9GB." Now that it's been explained, the requirement makes sense. However, I'm sure plenty of PC gamers would've appreciated the warning being listed on the game's box; especially if they already bought it.